Pixar is most known for its feature films and we sometimes forget that the studio is more than just a group of animators cranking out the feature of the year. If the large of employees who work in non-animation departments such as lighting do their job well, we are not supposed to actively pay attention to the films’ tecnical aspects, such as how well the scene is lit – the believability of the scene is where the true pride of these employees lies. Similarly, there are other departments within Pixar that we do not often think about because they work in the background and because their accomplishments are so great that their work is seamlessly represented in the final product. The theme parks department at the studio collaborates with Disney often to give park guests memorable experiences. The goal is to make the attractions feel magical as a way to transport those experiencing them. This team is not solely comprised of animators. Many of them have worked on previous endeavours at the Disney Parks. There is great depth in their experience as well. Many have been at Pixar working on the films, some as far back as 1988’s Tin Toy, as well as theme park projects for a number of years. Roger Gould, who directed the projection piece, was also the director of the work done at Pixar for the Finding Nemo Submarine Voyage attraction at Disneyland. He was previously the director of Mike’s New Car, the short that was attached to the Monsters, Inc. DVD release, and the co-director of Boundin’. 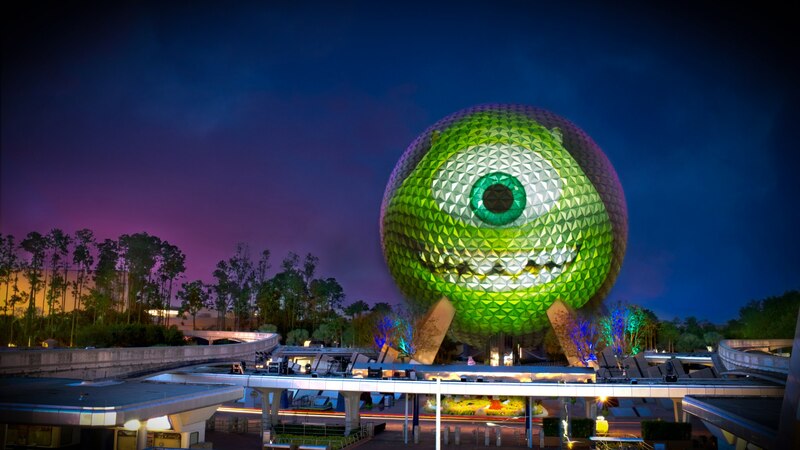 It was the work of all these employees at Pixar that made Mike Wazowski and Sulley come to life in epic proportions on Spaceship Earth last week. Next time you are at Cars Land at Disney California Adventure, enjoying Monsters, Inc. Laugh Floor at Walt Disney World’s Magic Kingdom, or riding Toy Story Mania! at one of the Disney Parks around the world, think about all of the time and work that was poured into them by the Theme Parks team at Pixar and the Imagineers at Disney. That attention to detail that these two companies are so passionate about is what lets you and me visit these worlds of fantasy and forget about all the troubles of the world.